Recently, the Immunopathology (IP) laboratory in LMP acquired some new immunohistochemistry stainers that are faster, more flexible and will improve turnaround time for our patients. It can take days – weeks – months – of invested time and energy from the laboratory staff in order to qualify and validate the equipment first to make sure that they are up to snuff. Then the team has to optimize staining protocols for each antibody, and validate these against known patient materials, and then continue to validate prospectively in the routine clinical testing environment. 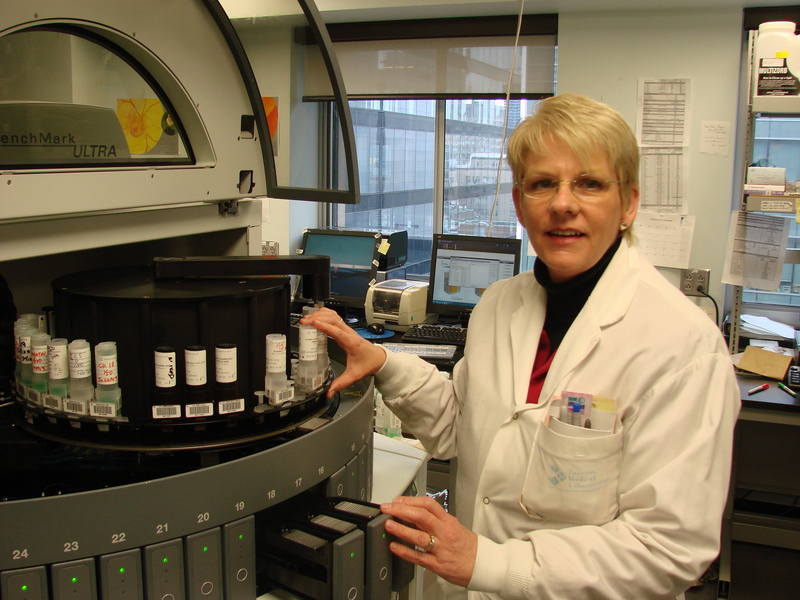 “The other machines, some of which we still have in operation during this transition, were workhorses of a previous technological generation,” said Laurie Mason, Manager, Pathology. “But, in LMP we have incredibly high volumes, very complex cases and we needed equipment that would keep up with the challenge required for greater sensitivity of testing and improved workflow. The team has done a tremendous job at getting this equipment up and running. With the new stainers there is no batching required, which means that there can be a continuous feed of slides into the machines. The team isn’t done yet and doesn’t expect to complete the final installations under spring 2014, but the new stainers are already making a significant difference to the team. “It’s faster and better for the patient. Everything we could ask for.” said Pam.